What a view! 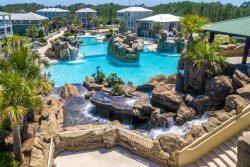 This high rise condominium in Seascape Resort is waiting on you to enjoy! Enjoy incredible views of the gulf from the balcony, living area, kitchen and master bedroom. Relax at the private beach access or at the lagoon style pool. Living room and Master bedroom have incredible views of the gulf and both have access to the huge balcony with dining chairs and lounge chairs! King bed in Master, Queen Bed in guest and queen sleeper sofa in living area with Tile throughout! Great Kitchen with gulf views for the cook and well equipped with stainless appliances and granite countertops! Convenient beach access - steps from the condo! Add $110 for housekeeping and 11% for tax. There is a $69 damage protection fee, $30 booking fee, and 2.5% to process credit card payments. A 25% deposit of the total rental amount is due at the time of booking to secure the reservation.